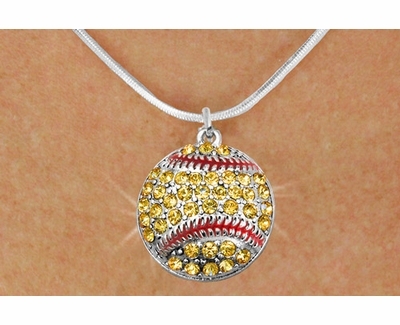 Fashionable Softball Charm Necklaces with Yellow Crystal Gemstones - Softball & Baseball Jewelry, etc. These very Stylish & Bright Yellow Crystal Gem Rhinestone Softball * BLING * Charm Necklaces feature a large fashionable Softball design Pewter Charm with LOTS of bright & shiny Crystal Gemstones, on a 21" long adjustable Silver Snake Link Chain. The Crystal Softball Charm pendant measures about 1" Diameter. Cool "bling" necklaces.... but they are bigger than I thought! I thought the charm would be much smaller and feminine. Looks like a big gawdy charm as big as a basketball. Disappointed in this purchase. Merchant Response:Please see our product description... we do list the exact Dimensions and Size of this Softball Charm. ProsWould be nice if ball was smaller in size.